Ornamental and fruit bearing, Pear trees. Alternate hosts Junipers and Cypress. 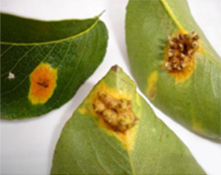 The disease is easily detected on pear leaves which become covered with orange spots in early summer and grey, fuzzy growth in the fall. It is usually the pear grower who first notices the disease. 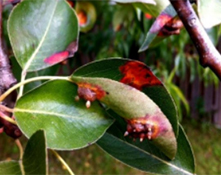 Severely infected pear trees may develop gall-like growths at the base of twigs. Infected junipers will continue to grow and appear healthy. 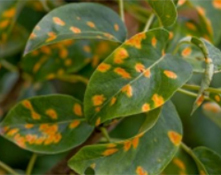 The first signs on Pear trees are bright orange spots on the leaves in late May. The spots enlarge during the summer reaching a diameter of 1-2 cms. By late June, the centers of the spots (on the upper leaf surface) exhibit numerous black dots. In July and early August, the infected area of the leaf becomes thickened as spore-producing structures push out from the lower surface. From late August through to leaf drop in October or November, grey hair-like projections resembling trellises emerge from the lower surface and release spores. These spores are capable of infecting Junipers. The only time that infections are obvious on junipers is during wet weather in April and early May. At that time, swellings on the Juniper branches release an orange jelly-like mass of spores. These spores are capable of infecting nearby Pear leaves which are just starting to grow. After the spores are released, the infection on Juniper remains dormant until the next spring. Plant Junipers and Pears as far away from one another as possible. Consider your neighbour’s plants as well as your own. Prune out gall like growths at the base of twigs on Junipers as these are a perennial source of infection on Pear trees. Fungicide treatments must be applied 3 times early in the spring.